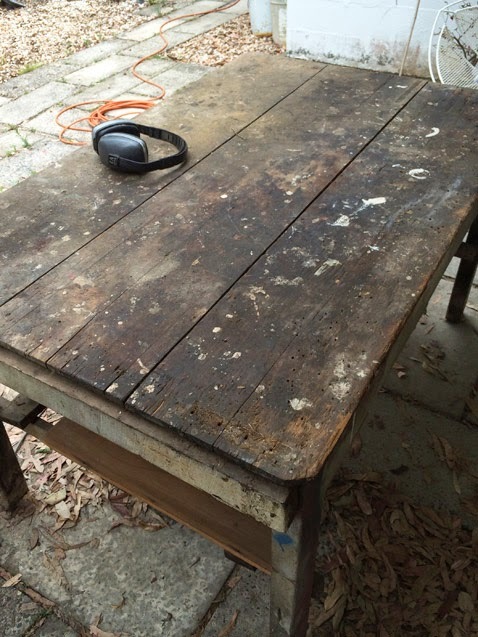 Last year our neighbour passed away, and sadly, noone in his family had room for his old worktable. Granted, it was super-heavy and covered in decades-worth of paint, oil, resin and who-knows-what, but I was delighted when George's son asked if we would like it. Yes please! 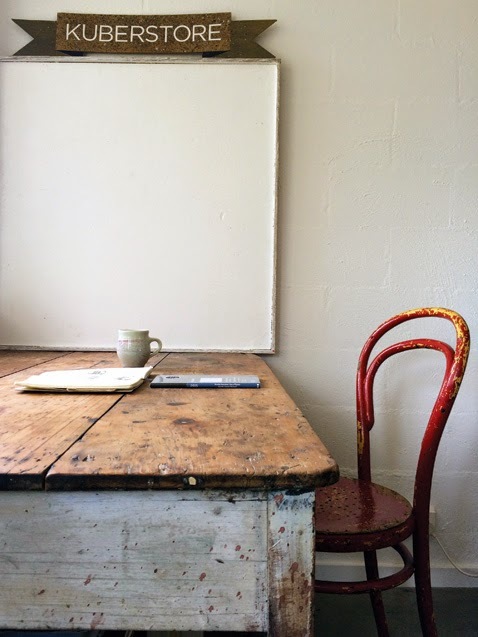 I'd been working on a too-large and ultra-wobbly trestle table, and this table was the solution: it was the right size, height, and was super-sturdy, too. I got the belt sander out, and promptly broke about ten belts taking all the muck back to bare timber. It was worth it. 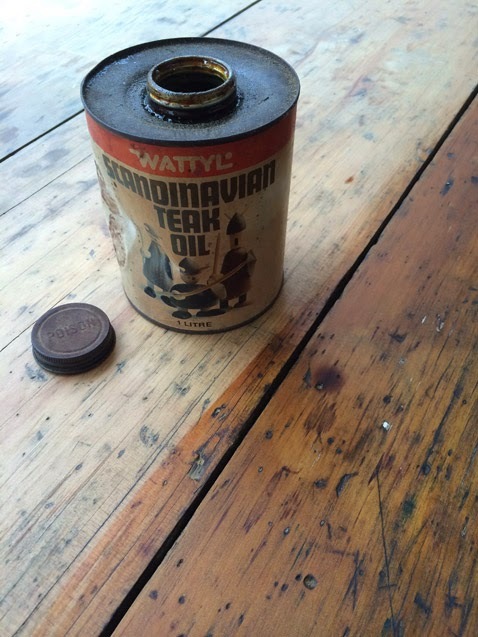 A rub-down with some teak oil re-hydrated the dessicated pine while enhancing the years and years of work-marks, which I love. The wobbly trestle has been banished to the storage room, and this little table is now proudly occupying a just-the-right-sized corner of my workroom. So, today it's the last day of the year. I LOVE this day. 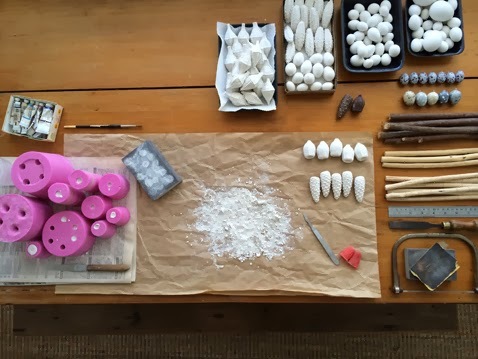 To me it feels full of creative anticipation and possibility, and I like to spend it cleaning up and clearing out my workroom. I like to know that when I awaken tomorrow I'll go somewhere to watch the sun rise (because, for this early riser, staying up until midnight to see in the new year is just a jolly inconvenience!) and then come home to a tidy workroom to welcome the new year and whatever it may hold. 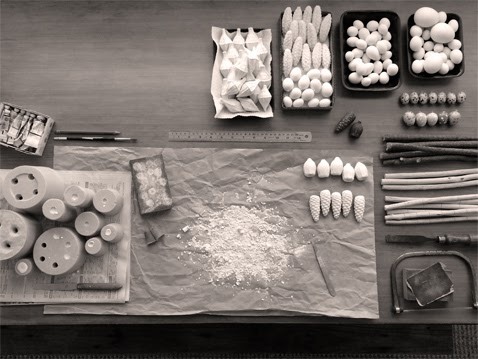 In anticipation, this morning I took everything off my pinboard and cleared the Christmas detritus off George's worktable. My first task in this newly-vacant space was to transfer all my 'stuff' from this year's diary to the next. 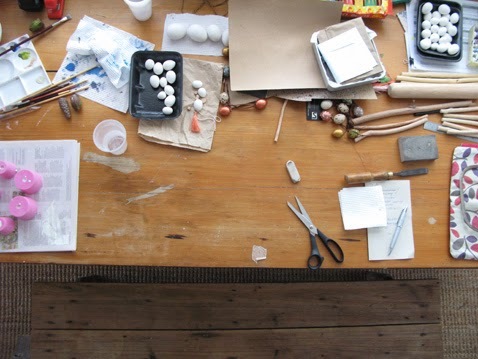 Now, I feel ready for tomorrow, and looking forward to making my own work-marks on this table in the coming year. A very Happy New Year to you! Hot cakes, Bah Humbug and other Kuberstore news. 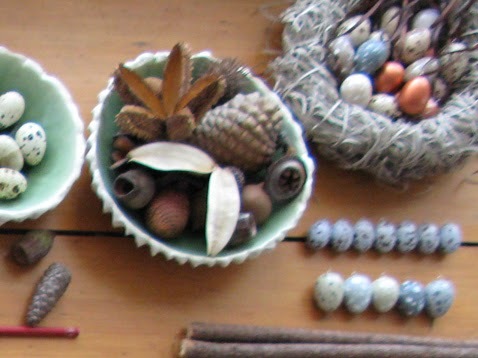 I do know what started the rush - one of my items was chosen as a feature image on Etsy's 'Home and Living' browse sections page, heading up the classification 'ornaments'. 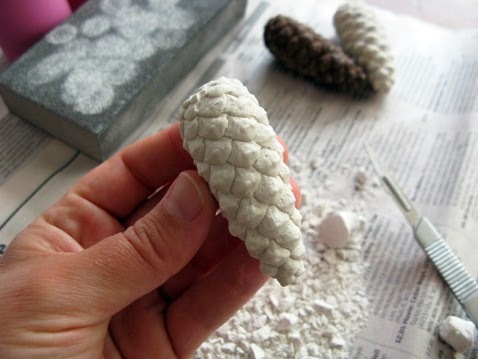 I've been making my little cast pine cones for a while and never (before this year) thought to list them as a set of hanging decorations - silly me, as it turns out, because this year they'll be adorning Christmas trees in Switzerland, Finland, Germany, Ireland, New Zealand, all over America (including my first order from Hawaii!) and within Australia, too. I've mentioned before that I love Christmas... 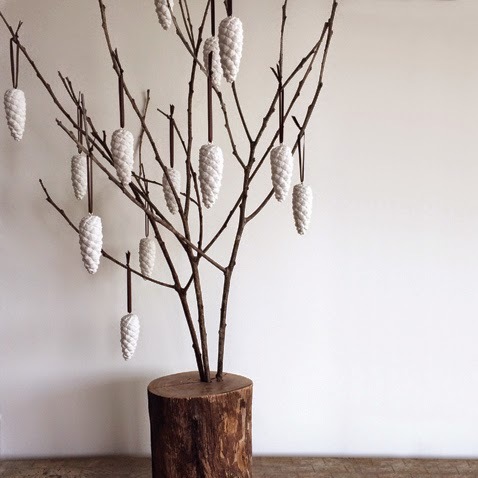 I love trees and decorations and wrapping presents and making cards - and it just gives me so, SO much joy to think of these little pine cones arriving at their destinations, being unwrapped and included in someone else's festivities. I feel humbled and grateful and delighted and excited every time one of those 'Etsy Transactions' emails arrives - a buzz that has never, ever gotten old! These 'hot cakes' moments are rare, and thus treasured. New in my Etsy store this Christmas are my 'Bah Humbug' plaster coal decorations, which have also been selling quite well at the markets - people seize upon them as a Secret Santa gift for someone who is, perhaps, less than enthused about the festive season. 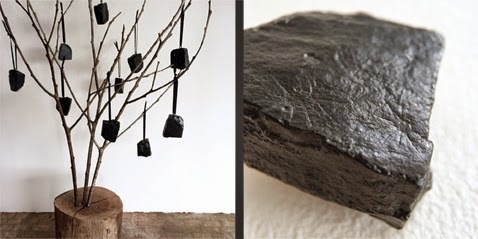 Referencing that story about naughty children receiving coal rather than gifts in their Christmas stocking, these painted hanging ornaments are cast in a mould made from a stone I've had since I was little. I kept it because it had two little sun-shaped fossils on one side, and the fossils came out excellently in the cast result. Hooray for Pinkysil! The BrisStyle Bazaar in the Whale Mall at the Queensland Museum was a busy day - and a great spot for a market as it nabs lots of passing trade and is protected and coolish. Plus the lights under the huge whales cast the most incredible electric blue and yellow shadows! 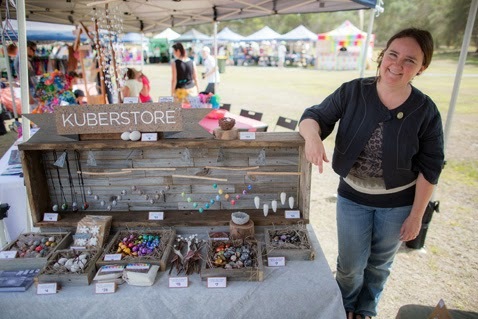 You might see on the left of the photo above that my new painted cast plaster necklaces have made their market debut. Followers of Kuberstore on Instagram have had a blow-by-blow account of their development, and I'm pretty excited about how they've turned out... stay tuned for a blog post about them soon. 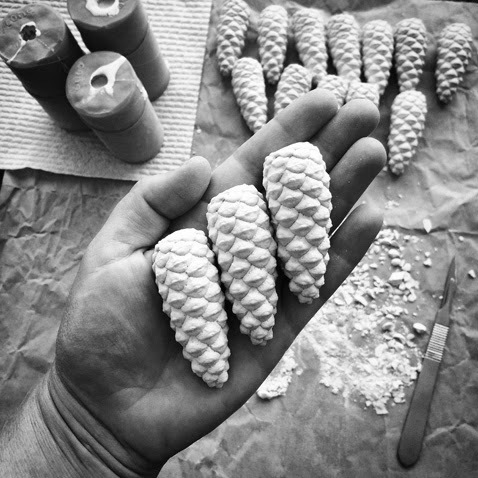 I'm currently using up the last of my plaster to make a few final pine cones... my last market for the year is this coming Saturday at Brisbane City Hall - this special (and final!) 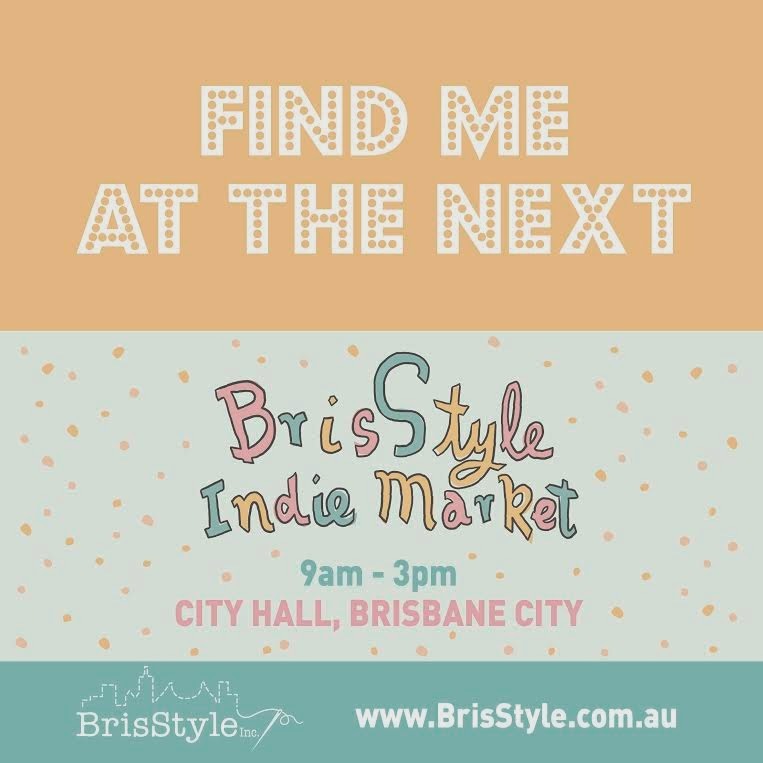 BrisStyle pre-Christmas market has the extended opening hours of 9am until 4pm, and I'll be there. Perhaps you will be too? C and I decided we would very much like to be married. Luckily for me, C wanted to do it with a minimum of fuss, too. So, I had a ring made. 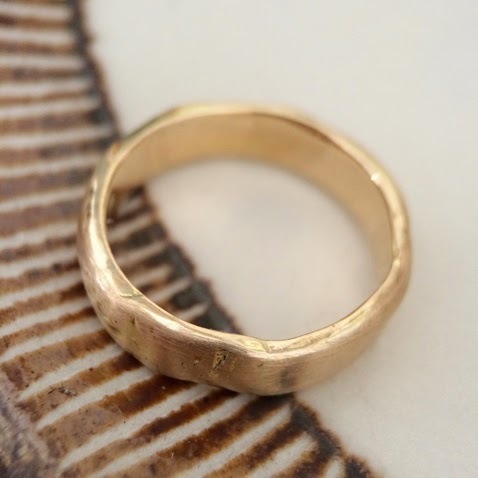 C didn't want one, being the sort of chap for whom rings create an occupational hazard, so I gathered a few bits of gold I had stashed away and gave them to my market friend Clare, the wonderful and talented jeweller behind Small Green Leaf. The gold I had was a delicate too-small ring given to me by a dear friend, a too-large thin gold band (that, family legend has it, was discovered by my Dad in the 60s on the bottom of a pool in London where he was working as a lifeguard, having been employed purely because he said 'I'm Australian' when he inquired about the job) and a few little chunks that my Nana Mary had been keeping - remnants and offcuts from alterations she had had done to her jewellery over the years. Clare graciously allowed me to hover around her workshop while she chopped it all up and melted it down into the sweetest little ingot, and later presented me with a ring of undeterminable carat-age which beautifully fit my criteria of wanting it to look 'like something that had been dug up out of a field'. 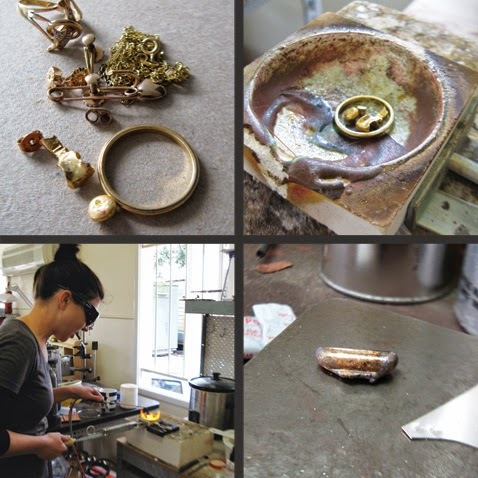 The gold collection, Clare's crucible, Clare wielding fire, and the sweetest little ingot. Next, we engaged the celebrant services of a jolly and champion bloke called Josh Withers, who was happy to come to our place and perform a brief ceremony that really just took care of the official bits as required by law. Easy. The day arrived. The house was clean, Oliver kitten had been brushed. C ironed his good shirt while I got a haircut, and presently my Ma arrived with a van-full of flowers. 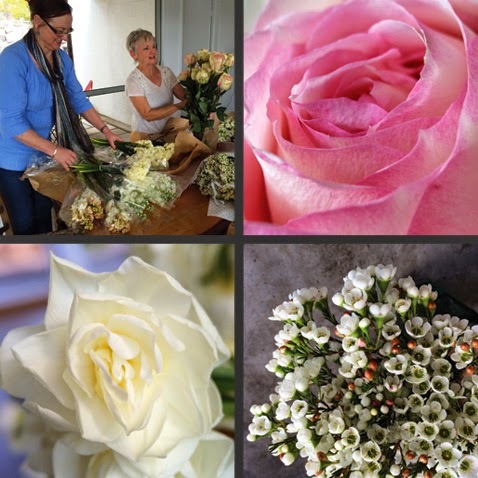 She and my Fairy Godmother Helen had stopped at the Rocklea Flower Markets on their way up from the Gold Coast, buying masses of roses, jonquils, tuberoses, stock, delphiniums, lisianthus, and those wonderful waxy natives that I can never remember the name of. Never one to wear white (or in fact any pale colour), I had found a lovely embroidered cream silk skirt from Zimmermann that I thought gave a nod to the idea of a wedding dress without actually being one. I wore it with a simple black jumper and a long string of beads. So, with every vase full of flowers (and some buckets, too), our house smelled incredible and was completely bedecked! Helen tucked some tiny roses behind my ear, and we were ready. 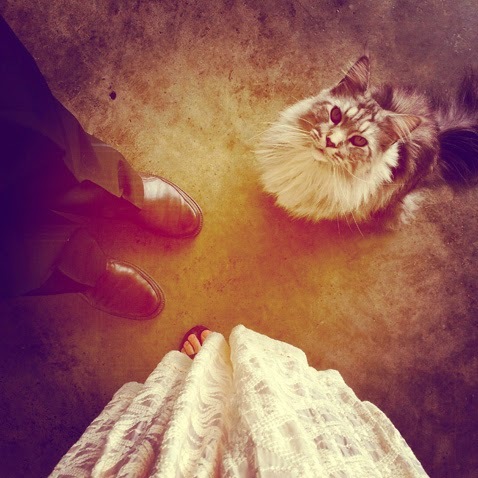 C, me, and Oliver kitten. Our nearest arrived, followed by Josh, and we stood around our kitchen table and said those simple, lovely, timeless words. There were smiles and laughter, and afterwards some champagne and cake. That evening we went to Mondo for dinner with the rest of our immediate families, and it really was the most uncomplicated, perfect day. 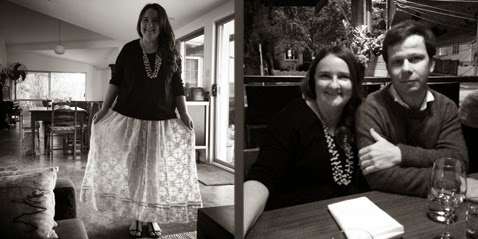 Me laughing about the transparency of my skirt, and me and C.
So now, we are married. We've had a road-tripping/camping Central Queensland honeymoon holiday, and I'm getting used to wearing my ring. Every now and then I look over at C and say 'You're my husband.' and he looks back at me, and says 'You're my wife.' and frankly, that delights me! ... on Finders Keepers countdown. 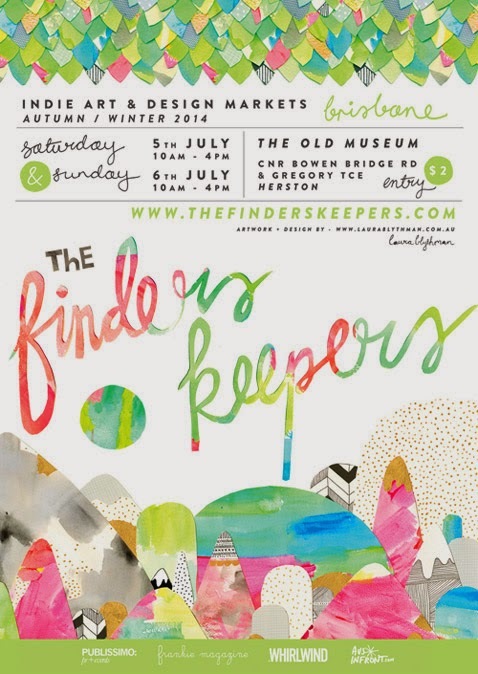 With two weeks to go until the next Brisbane Finders Keepers market, there's been a lot of preparing going on around here, and it's just stepped up a notch. Before it gets out of hand, I thought I'd let you know what I've been up to, and what you might see should you come visit me at The Old Museum on July 5th and 6th! 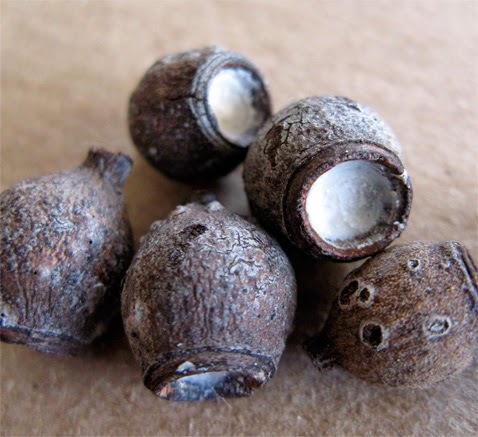 Recently I found a handful of tiny spotted gum nuts that immediately called out to be be-moulded and cast. I liked that they were somewhat warty and carbuncled - I've found that these textures transfer really well to plaster, so I gave it a go. 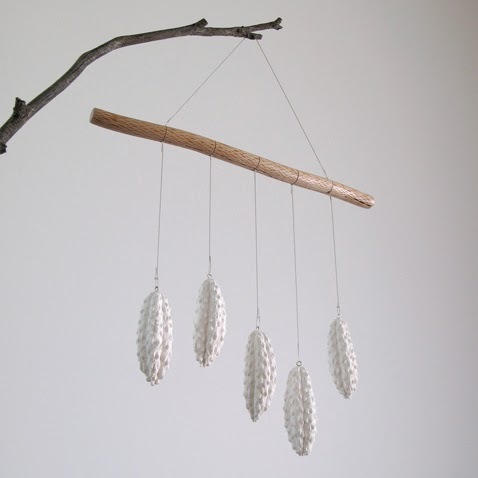 I fancied I could make the wee gumnuts into wall hangings and maybe a necklace, but as soon as I saw the cast result I wanted to put them onto sticks - a handful of which would look a bit nice standing in an old glass bottle, or maybe just one tied into the ribbon of a wrapped gift. 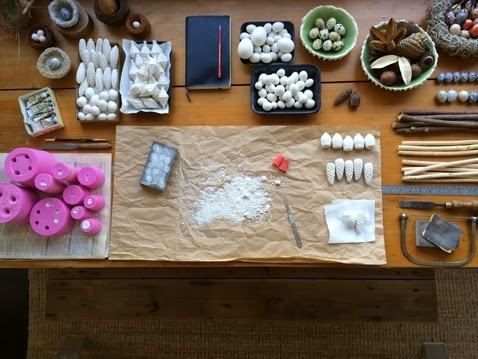 I have filled the interior voids of these spotted gum nuts with plasticene prior to taking a mould from them. 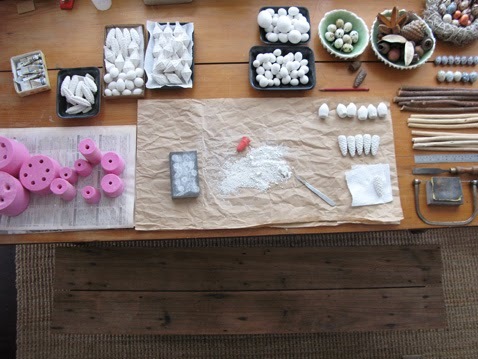 This makes the casting and demoulding process a bit tidier. 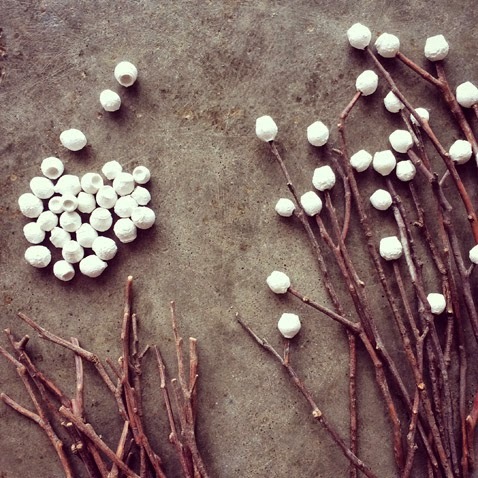 These are the smallest items I've ever cast - they are only as big as the end of a finger. I've rummaged about in the garden and found lots of little spotted gum branchlets, and given them a bit of a pruning and sanding. 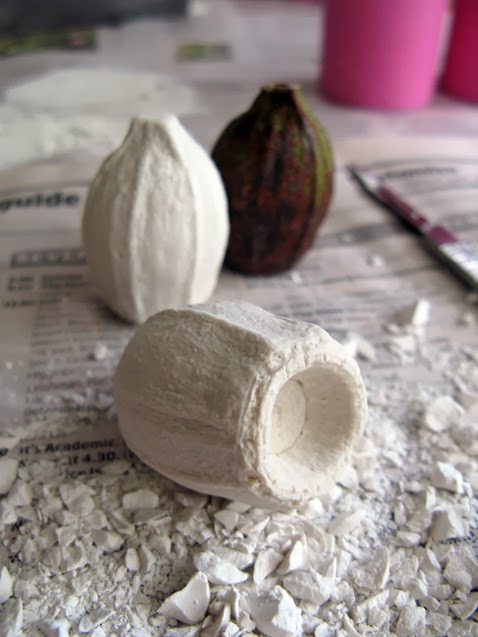 I'm drilling a hole in the plaster gumnuts and glueing them securely to the sticks. I'm quite liking the notion of using actual spotted gum branches for these spotted gum nut casts. 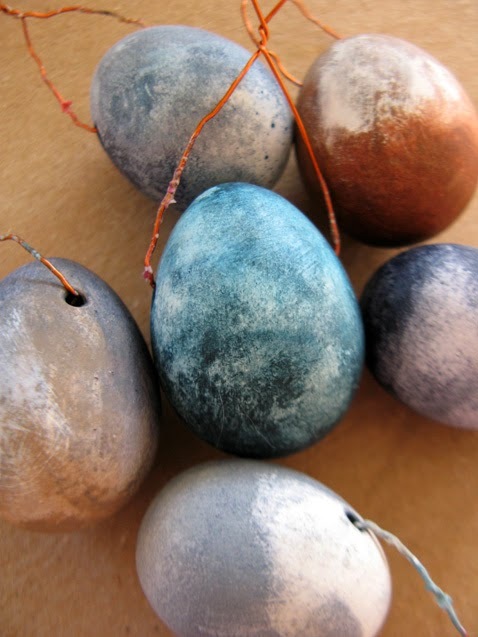 I have also been making some special painted plaster eggs to wear as necklaces. I've figured out how to drill right through an egg without it blowing out, and it requires accuracy, patience, and very strong fingers. As I'm a bit un-blessed with the 'patience' part, C has been doing it for me! 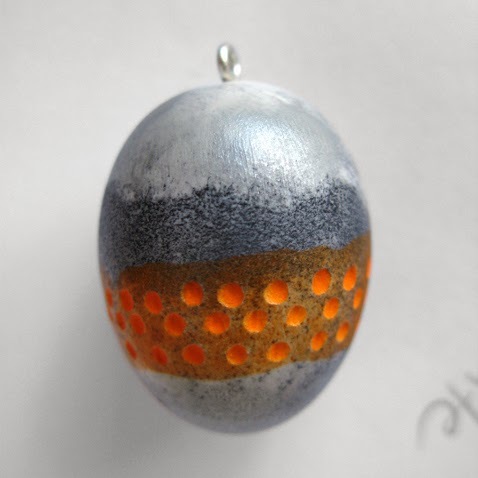 I wanted these necklace eggs to be extra-lovely, so have been building up layers of colour with watercolour and acrylic paint, wiping and/or sanding back the plaster and then painting more, to create a really rich background to add the speckles to. 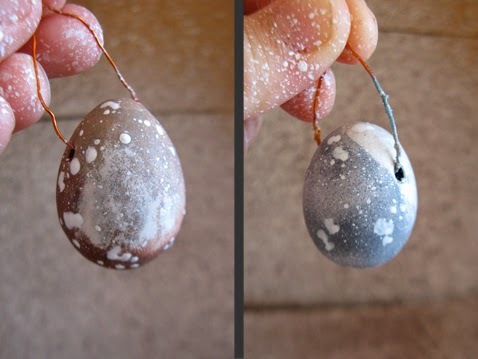 I've written before about how the differing densities of the plaster in each egg allow it to soak up more or less pigment, and I've allowed parts of that variation to show through. I've also tried to make sure that the two sides were a bit different, giving the wearer two options depending on their outfit/mood/preference. 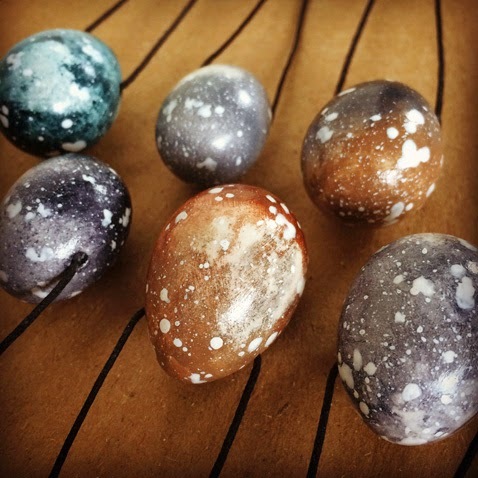 These necklace eggs are ready for speckling. Two different eggs... extra-careful speckling going on here. 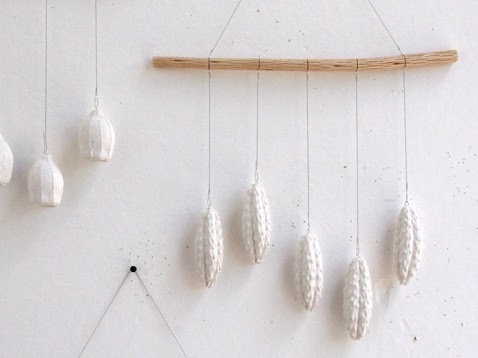 I trialled a few cords, including waxed linen and cotton, unwaxed hemp, and woven polyester. Although I initially wanted to go with a natural product, I settled on the polyester as it proved to be durable, colour-fast and super-comfortable to wear. The cord I've selected is a quality American-made type that makes an excellent adjustable/sliding knot. Wear it any length you choose. There's also a lot of list-making going on, and I'm looking forward to getting a few more things crossed off. I suspect the list has yet to grow before it gets smaller again but I'm starting to get excited, now. I've got little piles of postcards and business cards and stickers, a stack of my sewn brown-paper packing bags, and two lovely reams of recycled tissue paper to wrap everything up in. That part, at least, is under control! Now I just need to finish stocking up, sort out my new display pieces, pack up, and make my lunch. See you there! ... on new things and being out-of-place. And eggs. Well, it's done. We've moved house. I'm sitting here facing a strange wall in a strange room, surrounded by boxes, and I'm hoping that it will start to feel less odd very soon, as (I may have mentioned before) I'm not that great with big changes and associated upheavals. 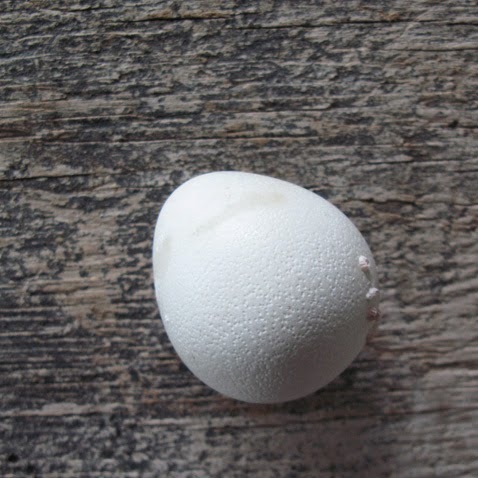 In the midst of all the ruckus, Violet (the solo female from my batch of five Pekin bantam chicks last year) has laid her first egg, which was very sweet and small and brown. 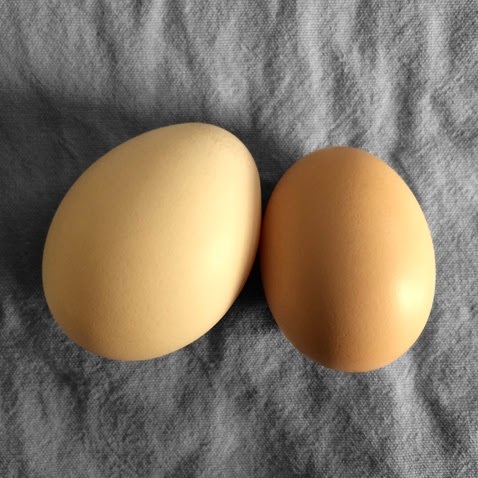 Here it is next to an egg from one of the grown-up ladies. I'm always delighted when a young hen lays her first egg. In the nestbox, too. Clever chicken. My Ma found an intriguing egg for me on the beach at Bilinga, where she now lives. She said it was just poking out of the sand a little bit, and at first she thought it was a ping-pong ball, as it was about that size. 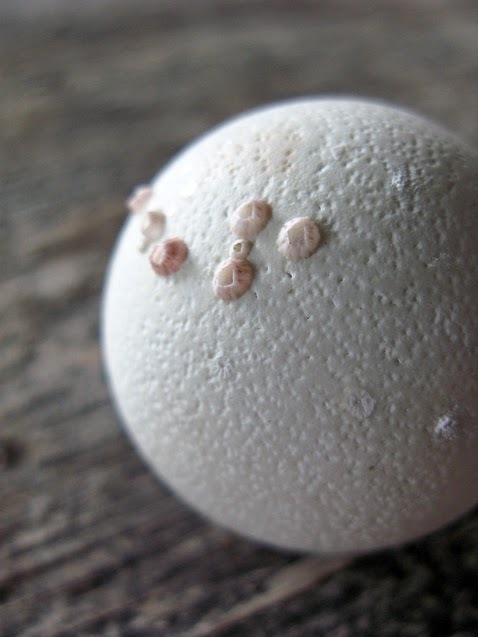 See, it has some tiny pink barnacles attached to it! For some reason this egg had been floating about in the sea long enough for barnacles to adhere to it. It had distinct pores, and one end is almost spherical, the other quite pointed. It was quite ominously heavy. To my horror the day after my Ma had given it to me Something Started Oozing Out of it and stinking up the drawer I had placed it in to prevent Ollie breaking it. Ugh. This curious egg is now residing in a sunny spot well up the (new) back yard away from the house where it might dry out. 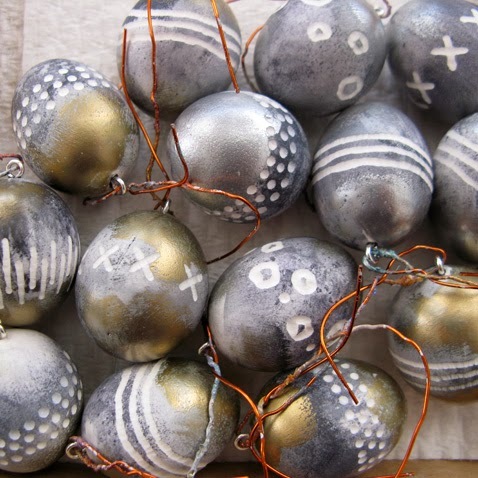 I do hope it will, as some of my other egg specimens have done when given enough sunshine and time. Pew, what a pong, though! It was the sort of magnificent stink that lingers in your nose and taints the taste of everything you eat for some time! Anyway, like the egg floating in the ocean (how? why?!) 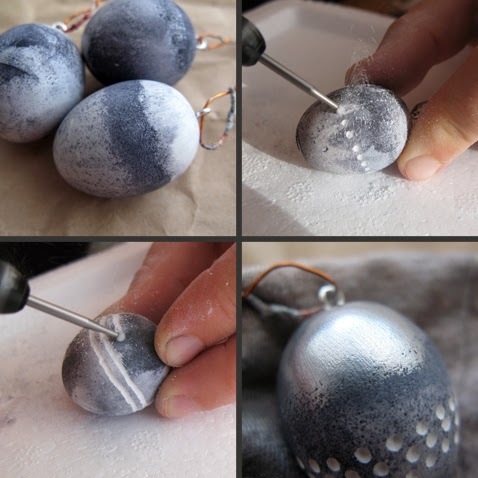 or the barnacles attached to an egg (huh?) I'm somewhat out-of place. I can't remember what's in all these boxes. Better go and find out, hey? So, I'm pretending that we aren't in fact moving house anytime soon, and have decided to Get On With It. I'm feeling better already. 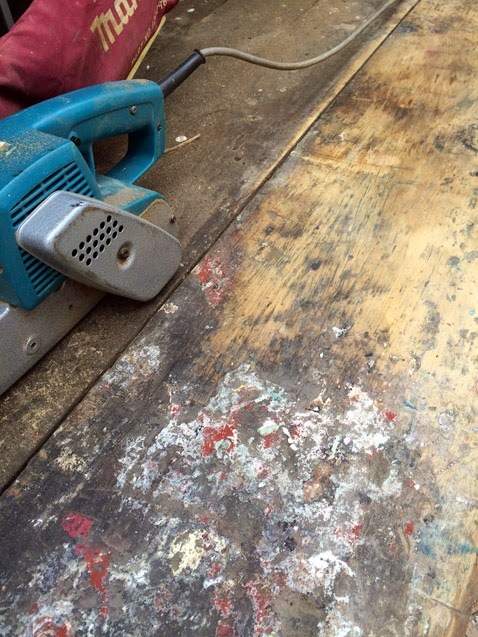 The studio is vacuumed (it was disgraceful, the floor had been almost obscured by shredded paper and plaster dust for months. There were a few alarming rattles up the vacuum hose but I guess I'll figure out what they were when I go looking for that tool and can't find it.) and the room is feeling again like a productive workspace rather than a niggling job on my cleaning list. To celebrate, I've been making some more mess! 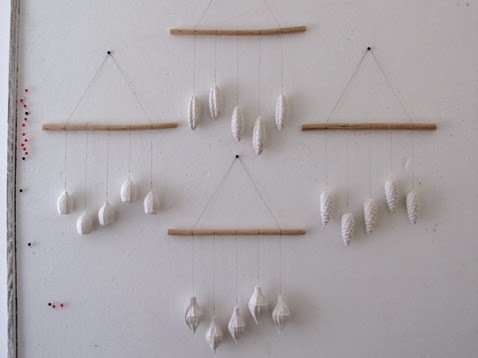 I've been meaning to expand on my seedpod wall hanging range ever since, a while back, I found a tiny sweet pine cone among my grandmother Mard's seedpods, which she collected on her travels around Australia with my grandfather. 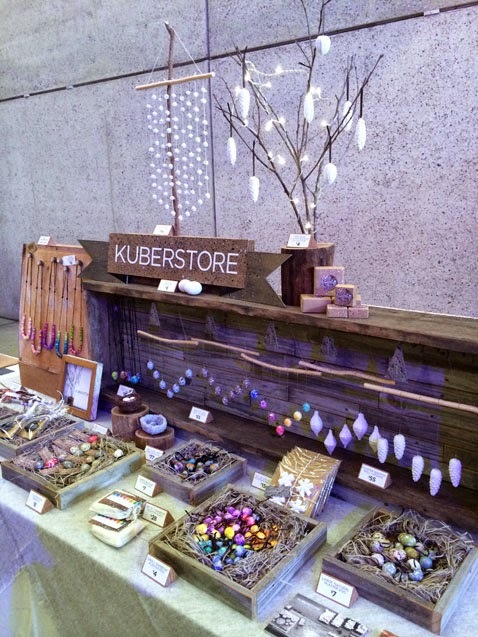 Followers of Kuberstore on Instagram will start to see the emergence of a pine cone theme. Along with the pine cone, which I thought might mould up nicely, I recently found a handsome and suitable gumnut that I thought might also work. This morning I busted out some Pinkysil and went for it. I'm still in love with Pinkysil as a mouldmaking material - it sets so fast that you can go from 'no mould' to 'removing first casting' within an hour. Suits my impatient soul! Inbuilt mould identification for the first time ever! 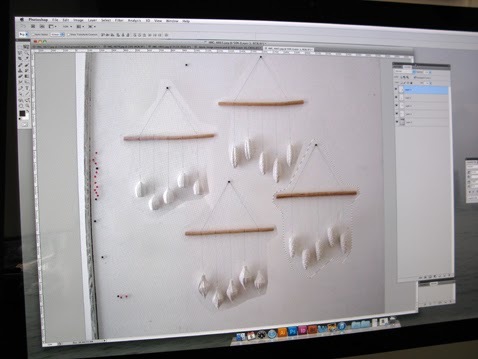 I wish I'd thought of this before now, because I often find myself squinting into similarly-shaped moulds to try and figure out which one I want. 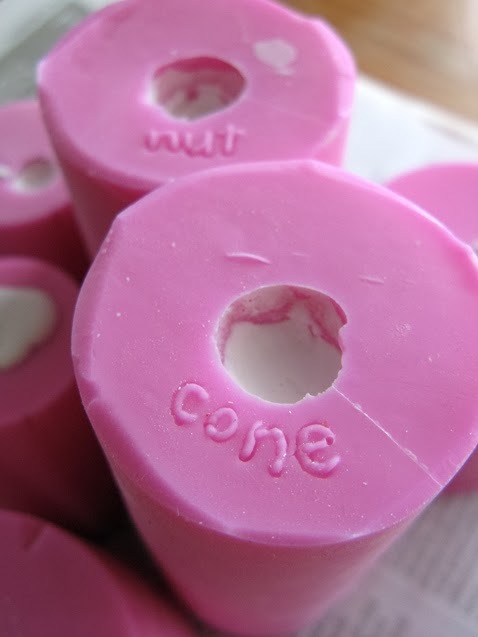 This time I wrote (backwards) into the base layer of plasticene with a sharp pencil before pouring the silicone. Yay! It's so exciting to crack open a mould for the first time and see the cast result. Double joy for me this morning! 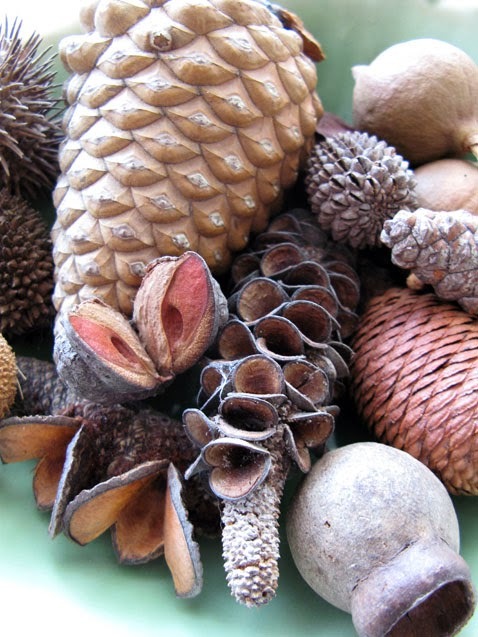 Pine cones and gumnuts... and wall hangings to come. Progress! AT LAST! ... on hair. Grey bits, and Something I have just learned. I found my first grey hair at age seventeen, with a predictable degree of disgust. For a few years I experimented with as much hair colourant as any young woman, veering from almost-blonde to darkest-brown, with a rather risque peroxide and mulberry streaking period sometime in the 90s when I was a hair model for a girl I worked with. I found, like many young women, that dyeing your hair all the time really screws it up, and the only way back to nice hair (for me) is to grow it out, which takes ages. So, I haven't dyed my hair for years, and I have to say that I've enjoyed having hair in my 'natural' colour - generally brunette: darker brown at the roots, with degrees of sun-bleaching about the ends which may or may not in some lighting conditions look a bit reddish. And grey, of course. They've been multiplying happily ever since that first grey at seventeen. Scrutinising this photo of me and Ollie the other day prompted me have another look at the back of my head with the aid of two mirrors. As you do. I made an interesting discovery. Some of those greys are as long as the longest hairs on my head, which at the moment is hanging at around the middle of my back. I'd never noticed that before. I also realised that as far as the placement of greys goes, I'm starting to develop concentrated areas of greyness that may be described as... streaks. Yes, grey streaks. Now, I started loving my greys years ago. As a twenty-four year old I'd been introduced to a girl, only just older than me, who had developed a strong grey streak in her fringe, and she was rocking the look. 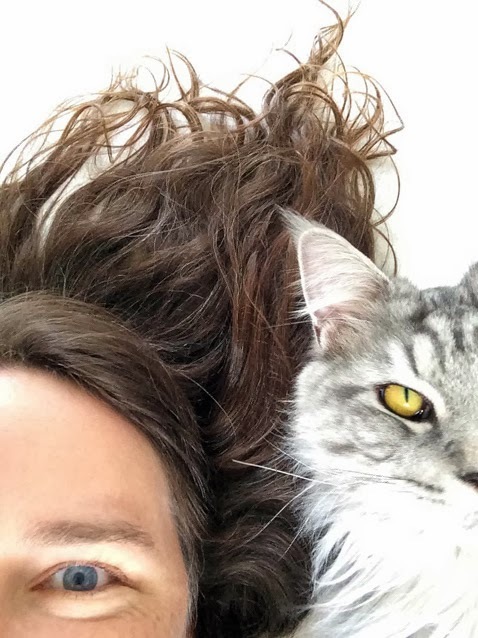 I was in deep admiration of her grey streak, and it changed the way I felt about my own regrowth. I thought that, over the course of a (hopefully long) lifetime, a girl really only has a short time to enjoy her natural hair colour before it goes grey, and chances are it'll be grey a lot longer than any other colour it ever was. So, I chose to enjoy. I'm sure some women can dye the hell out of their hair and suffer no adverse effects - not me. I'm not saying I'll never hit the bottle again, but for now, no. Anyway, I'll be forty next year, something that I can scarcely believe. Another thing I can't believe is this little snippet about long hair care which I've only just discovered. I had thought that my hair had a 'maximum length' (for me, about mid-back), where it just wouldn't get any longer before shedding and breakage and regrowth somehow cancelled each other out. Then recently - a revelation. I don't remember where I read it, but it was about how you get water out of your hair. I've always been a bit of a 'throw hair forward, cover with towel and scrub the blazes out of it' type of girl, and it turns out this could be the cause of my problem with (ahem) breakage. I feel so dimwitted about this. Apparently long hair needs to be treated gently! Huh? Squeeze the water out! NO scrubbing with a towel! NO! Such a simple thing. WHO KNEW!? 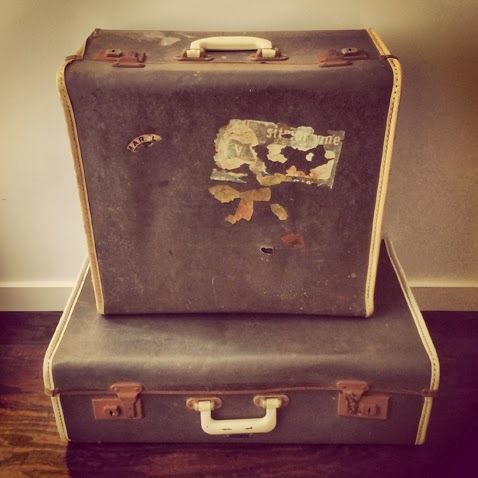 ... on packing, or not packing, and somewhere inbetween. A little while ago I mentioned that we're moving house. At the time it seemed like the most imminent thing but due to one thing or another (more like 'one thing AND another, and then many more other things') it just hasn't happened yet. What with the holiday season and a long delay to a certain process (we're waiting on YOU, concrete-floor man!) it seems that my builder's maxim ("Double the time you think it will take and you'll be halfway there") is ringing true for us moving house, too. I feel a little bit in limbo. 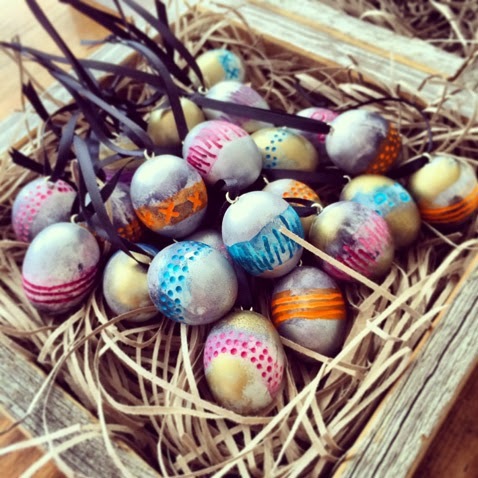 I've been hesitant to get too involved in making anything, and my Etsy store remains closed for the moment. There's a number of piles of weeks-old half-started things on my worktable, and this sits awkwardly with me. Small hurdles seem insurmountable (WHY can't I drill right through one of my plaster eggs without breaking the bit, damnit?!) 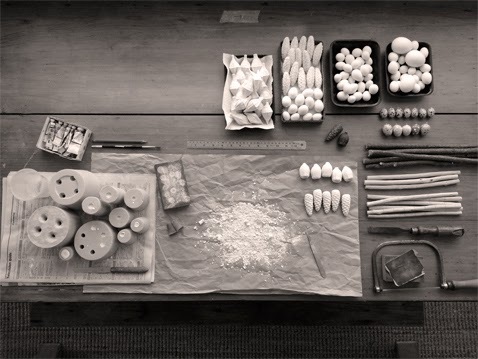 and the idea of packing up my lovely studio weighs heavily. I feel like I've only just moved in to it, although it's been more than a year. The as-yet-unpainted bathroom door mocks me somehow - I'll need to do that (insurmountable!) before we get our little house on the market. The garden here is running a bit rampant in parts, and is desiccated and bare in others. After all, there's not too much point in getting more vegies going when we'll be leaving them, is there? My gardening head is already thinking forward to the removal of weeds and sunburnt bromeliads at the next house. So, as someone who doesn't really embrace change all that willingly, the stalling of this one has put me out of kilter with the things that are most good for my soul! But, on account of the fact that it is suddenly February already, I'm feeling like I need to take control of this wait somehow. My Ma has suggested that I reopen my Etsy store, and pack up most of the studio, leaving out only the things I need to fill any orders that may come through. It seems so simple, but I needed someone else to point it out! If anyone has any advice about how to manage indecision, running a handmade business through a house (and studio) move, and also about a vague and persistent lack of focus, please do share! I'd be greatly appreciative! ... on a mystery, solved! 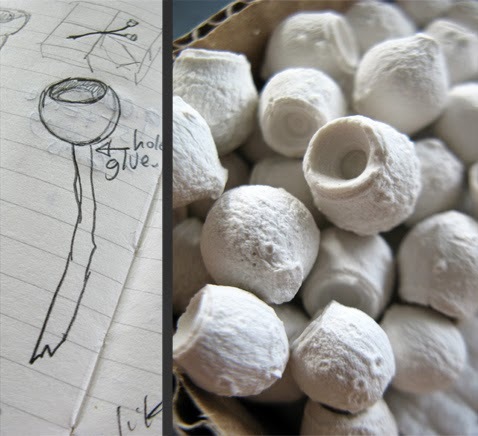 Quite some time ago I wrote about finding these seedpods, which I then made a mould from and began casting. 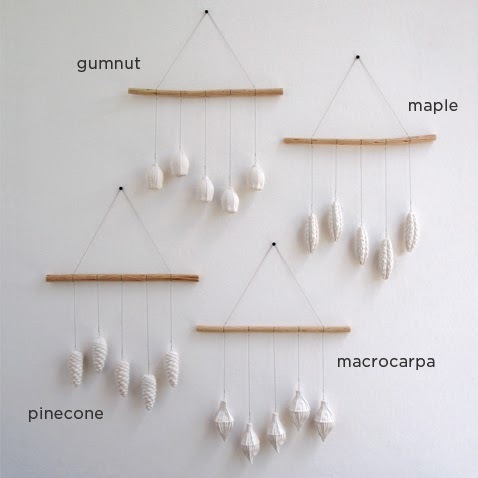 The resulting plaster versions have been featuring on one of my wall hangings ever since, but when people asked me, I had to admit that I didn't know what kind of a tree they were from. I'd posted the question on an Australian plant forum, where it was suggested to be an immature Crow's Ash seedpod, which I thought was a possibility until I found a tree in the park and saw what the young pods looked like. 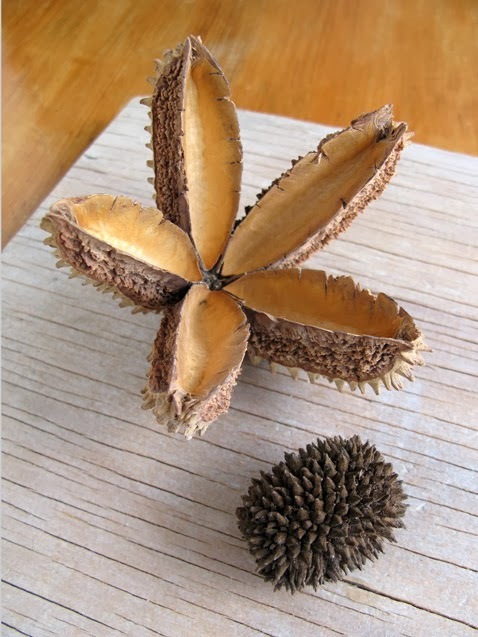 Crow's Ash (Flindersia australis) seedpods. The large open one was collected by my grandmother Mard somewhere on her travels, and the small one is an immature pod that I found beneath a tree in the Seventeen Mile Rocks park on the bank of the Brisbane River. 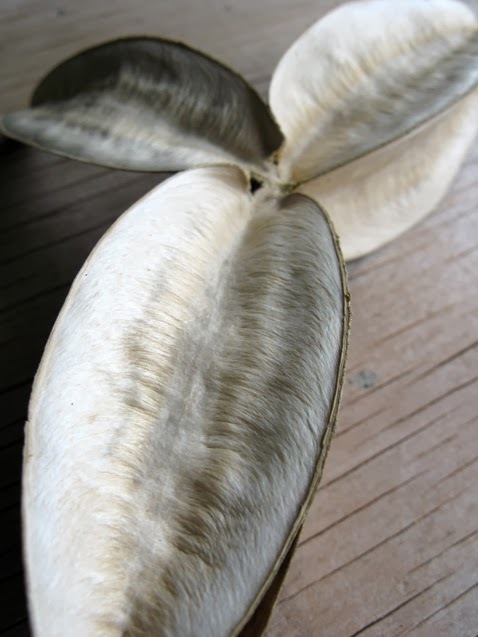 At the Finders Keepers market, one visitor said they looked just like bitter melon, and they do, a little... except bitter melon are green and large and the mystery seedpods were woody and small. No go. It's funny - sometimes if you wait long enough, the answer to an old question will just... appear. On my morning walk yesterday I took a route that I hadn't been along for some months. I was halfway up a particularly vicious hill, bordered on one side by a patch of bushland. As there was no footpath and the side of the road was gravelly and rutted, I was watching where I put my feet. Suddenly, among the spiny lantana branchlets grabbing at my socks, I saw a woody seedpod. It had opened up into three parts, but I could see that it had five lobes, and a rough exterior texture like my mystery pods. I peered up at the tree above, a towering rainforest-y type with large leaves and a smooth, mottled trunk. Could it be? The mystery seedpod is as big as my hand... but what IS it? Although Google had previously been no help to me, now I had some more information. I knew it was a tall rainforest tree native to Brisbane. I found a comprehensive list at Greening Australia, and started at the top. Some of the species had photographs of their fruit or seedpods, but for those that didn't I searched the scientific name in Google images. That's where I struck gold. My tree, with my pods. HURRAH! It's Queensland Maple! Flindersia brayleyana! 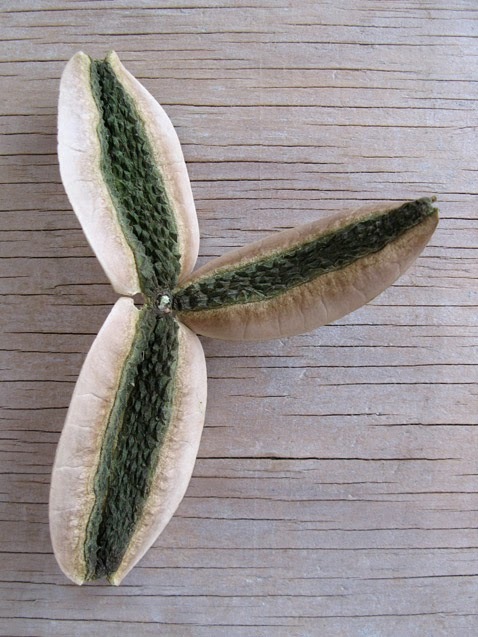 The interior of the Queensland Maple (Flindersia brayleyana) seedpod has the most wonderful texture - silky and papery and yet somehow woody at the same time. I was on the right track with the Crow's Ash, even though they look like such different trees (and such different immature pods), as they both turned out to be Flindersia. I am so delighted to finally know what this is, and extra-happy that it's a Brisbane local!